Our Vielma line has a long history in North America, and we have traced them back to the late 1700s to the Northern Mexican state of Chihuahua (and possibly Coahuila). There appears to be nothing definitive regarding where the name originates, although online discussions include Spain, Portugal, Italy, and even Germany. Related spellings include Bielma, Bielmas, Viedma, Bilma and Bilmas. As far as we can tell, the Vielmas did not have a coat of arms. Like many Spaniards in Mexico during the colonial period, the earliest Vielmas were soldiers serving in military forts on the northern frontier, largely to protect Spanish missions from raids by indigenous groups. Our direct line ancestors are highlighted in red text below. We have not yet located birth information for Antonio. He is our earliest Vielma (to date) and was the same Antonio Vielma listed on the 1807 census muster rolls of the Segunda Compania Volante de San Carlos de Parras (Alamo de Parras) as a 26-year old widower (he is the eighth listed soldier). The company was formed around 1784 and composed of 100 experienced mounted lancers, mostly from the pueblo of San José y Santiago del Álamo (present-day Viesca) in southern Coahuila, near the city of Torreón. 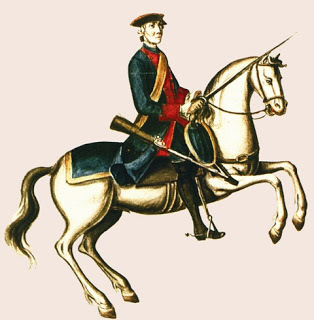 The men were organized on horseback and with lancers and, unlike other static presidio soldiers, the members of the compania were meant to be mobile and able to quickly respond to threats to Spain’s northern missions/presidios. As a result, the company was eventually assigned to several presidios in Northern Mexico after its founding, including the Presidio de San Carlos, Mapimí, Presidio de San Geronimo (Aldama), and the famous Presidio del Álamo de Parras (the Álamo) near present-day San Antonio, Texas. An interesting note is that the famous Álamo Fort in San Antonio was so-named because it was settled and fortified by the Segunda Compania Volante de San Carlos de Parras beginning in 1803 until the well-known battle in 1836. As previously mentioned, most of the soldiers in the company came from the region of present-day Viesca, which was known for its many Álamo (cottonwood) trees. 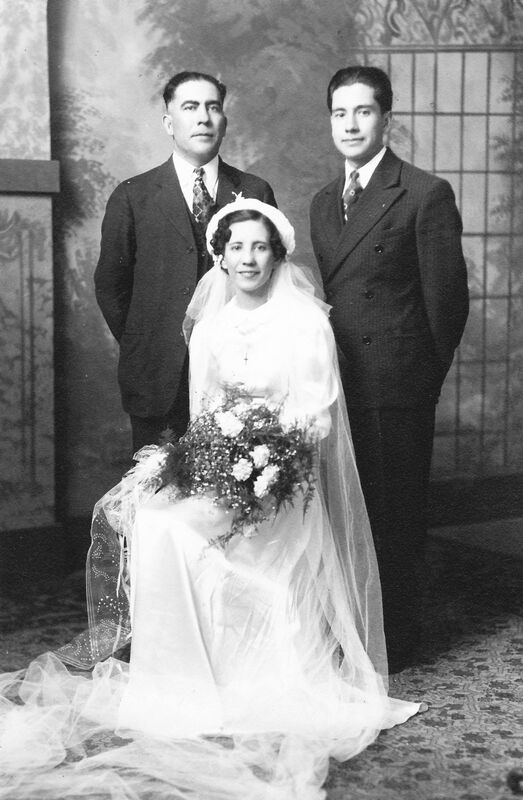 Antonio was married to Maria Josefa Escobedo, although we have not yet located a marriage record/date. Francisco Fabian, born January 15, 1801, married Maria Dolores Calletana Duran. At the very least, Antonio must have served in the Compania from 1801 (the birth of Francisco) until the 1807 census. 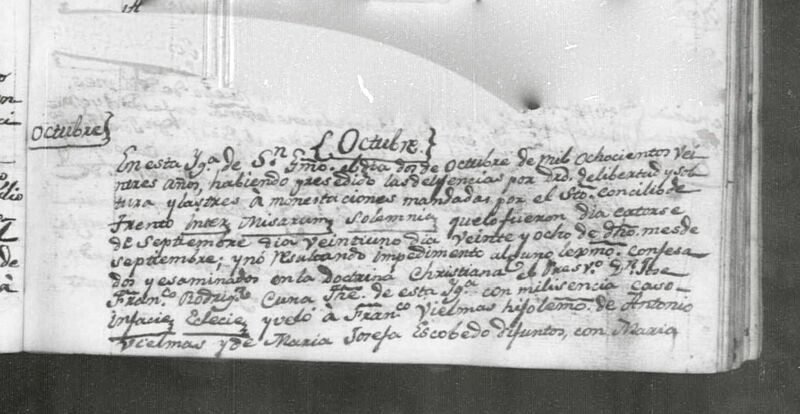 Antonio died before 1823, the year their son Francisco was married: Francisco’s church marriage record notes that both of his parents died while he was young, and other records indicate that he was raised from a very young age by his godmother Maria Tilana Torres. He may have died at the Álamo, or perhaps in a patrol of other Spanish presidios on the northern frontier. We know that Maria Josefa died before 1807, as Antonio is listed as a widower in the aforementioned 1807 Census of Álamo de Parras. 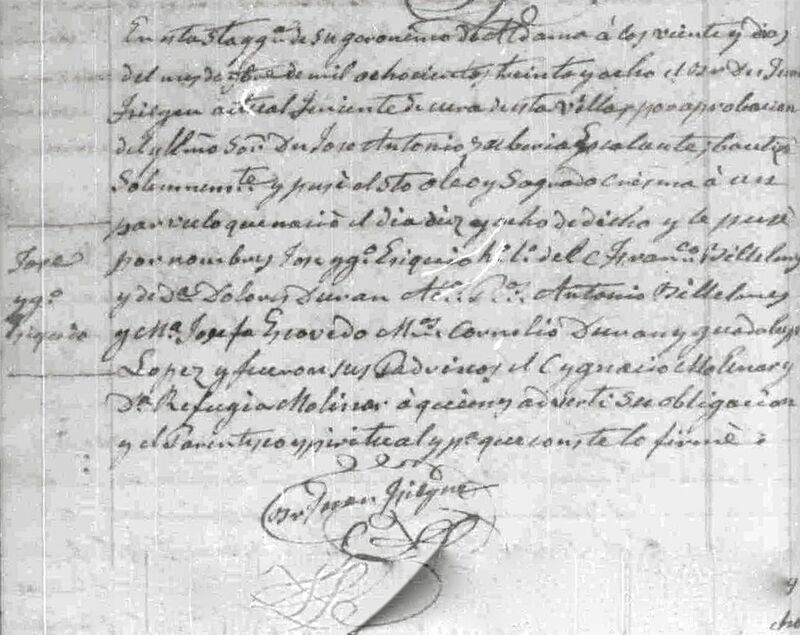 According to Baptismal records of the Compania Volante de San Carlos de Parras, 1788-1825 transcribed by John Ogden Leal, Francisco was born in the Presidio de San Geronimo (present-day Aldama in Chihuahua State) on January 15, 1801. He was baptized five days later on January 20 by Father Jose Bravo; his godparents were Jose Hernandez (a soldier) and Maria Torres. Francisco is noted as a “mestizo” on the record, implying that he was the offspring of European and an indigenous Mexican. Much of what we know about Francisco comes from his marriage record as well as the birth record of his several children. Francisco married Maria Dolores Calletana Duran on October 2, 1823 in Aldama, Chihuahua. Dolores was born in Aldama on October 6, 1806 to Martin Salgado, a soldier, and Maria Guadalupe Lopez. Dolores carried the name “Duran” because her mother was actually married to Cornelio Duran, a corporal attached to the Presidio San Carlos, just outside Aldama. 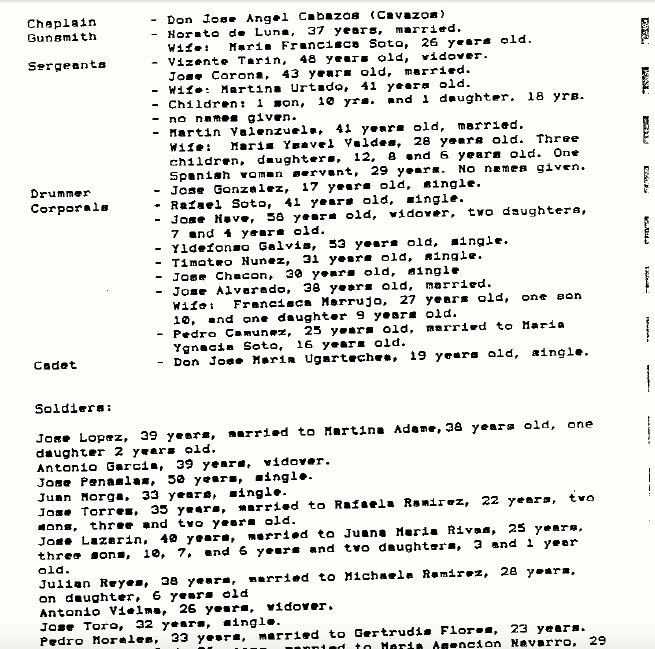 In the baptismal records from the Iglesia San Jeronimo in Aldama for all of the first four children born to Francisco and Dolores, parents and both sets of grandparents are listed. 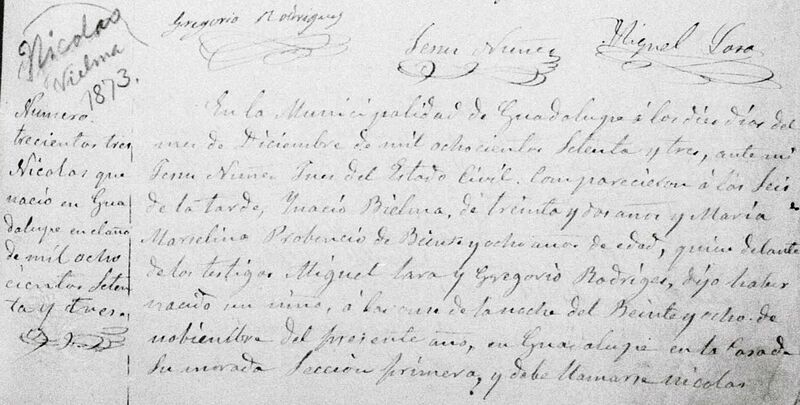 A death record for Francisco has not yet been located, although he may have been living as late as 1858 – the marriage record of his son Ascencion, while mentioning his parents does not specifically state that the parents were living or deceased. Information in Guadalupe church and civil records indicate that Francisco and Dolores likely moved from Aldama to Guadalupe-Bravos (some 250+ miles) sometime between 1849-1858. Ignacio was born on October 18, 1838 in Aldama, Chihuahua and baptized at the San Jeronimo Church. His baptismal record lists his parents and both sets of grandparents. Research from extended family members related that Ignacio owned a mill in Guadalupe, Chihuahua – a small farming community on the border with Fabens, Texas. Apparently, many people in town would bring their corn and wheat to have it ground at his mill. Ignacio never married, but apparently had a long-term relationship with a woman named Marcelina Provencio, whose family was originally from San Elizario, Texas (while Texas was still part of Mexico). Marcelina was likely born around 1840 and was the daughter of Francisco Provencio and Tomasa Almengor. The Provencios were one of the families that left San Elizario by crossing the Rio Grande to remain Mexican citizens after the 1848 Treaty of Guadalupe Hidalgo ended the war between Mexico and the United States. Marcelina was born around 1840 in San Elizario and legally married to Gregorio Ruiz in 1856. The two had several children together, but at some point she became involved with Ignacio Vielma. Marcelina and Ignacio had seven children together, and nearly all baptismal records for these children note that while Marcelina was married to another man, she was living openly with Ignacio. Marcelina likely died due to complications associated with the birth of her last child between April 4-9, 1880, although no death record has been located. At some point after the death of Marcelina, Ignacio and two of his sons (Ignacio Jr. and Jesus) moved across the border and settled in the small town of Santa Teresa in then-New Mexico Territory. Santa Teresa is about two miles north of the Mexico border and just across the Texas state line and the most northwestern reaches of the city of El Paso. According to state records, Ignacio worked as a carpenter, while his two sons worked as farmers. 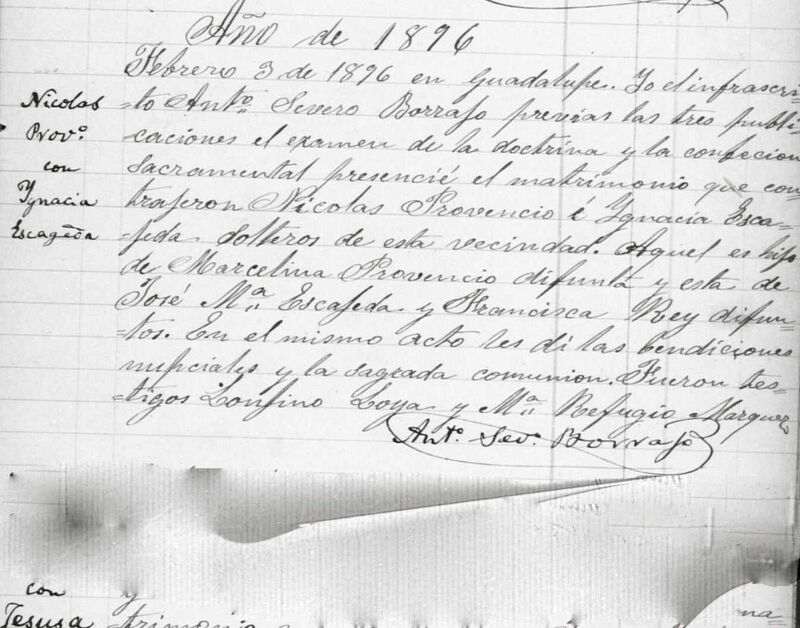 Ignacio died on May 12, 1909 in Santa Teresa of “dolor colico.” The death record is signed by his son Ignacio Jr. It is notable that he is the first Vielma in our line to move permanently to the United States, and it appears that most of his children also eventually settled in the United States, including his daughter Francisca (who settled in Arizona), Ignacio Jr. (who settled first in New Mexico and later in Arizona), and Nicolas (who lived in Texas, Arizona, and California). These were some of the earliest Vielmas to settle in the present-day United States. Nicolas was born in Guadalupe, Chihuahua on November 28, 1873. He was a farmer when he married Ignacia Escajeda on February 3, 1896 in Guadalupe. Ignacia was born on October 28, 1881 in Guadalupe and was the daughter of Jose Maria Escajeda and Maria Francisca Rey. Check out this site for an interesting discussion on the rich history of our branch of Rey families from their time in northern Mexico, New Mexico, and Texas, including Maria Francisca’s (mentioned two lines above) grandfather Isidro, who was a high-ranking officer in the Spanish army, Lieutenant Governor of El Paso, and later Lieutenant Governor of New Mexico). Nicolas and Ignacia lived in Guadalupe until approximately 1903-04, when they moved their family north across the Rio Grande to El Paso, Texas. Even as the Vielmas were the last of our “Mexican” branches to come to the United States, their arrival still preceded the first large-scale Mexican immigration to the United States (1910-1917) by several years. 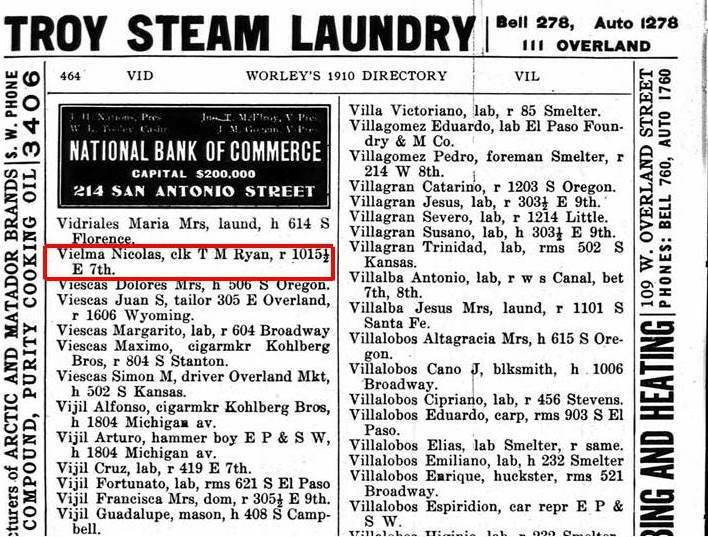 Nicolas appears in El Paso city directories from 1907-1910 working in different years as a laborer for the El Paso Foundry and Machine Company (1907), a laborer (1908), an electrical lineman (1909), and as a clerk for T.M. Ryan, general traffic manager of the Mexico-Northwestern railroad (1910). 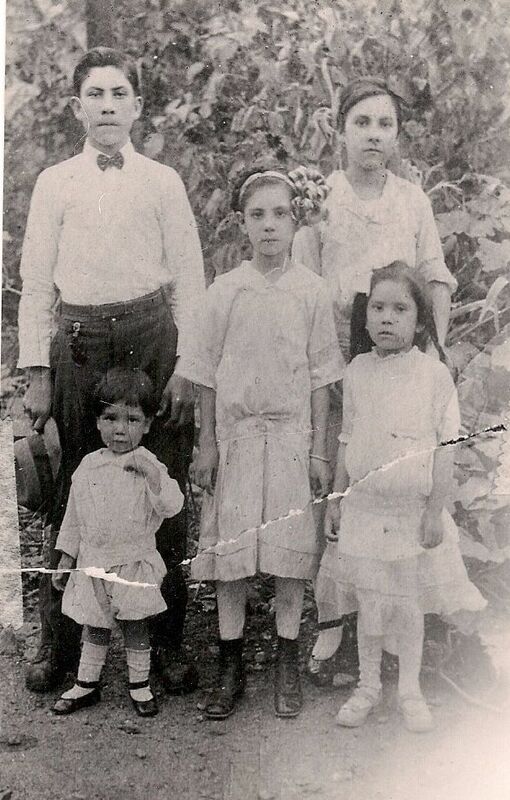 The 1910 U.S. census shows Nicolas, Ignacia, and their four children living in El Paso in a rented house on 7th and Mill Streets. 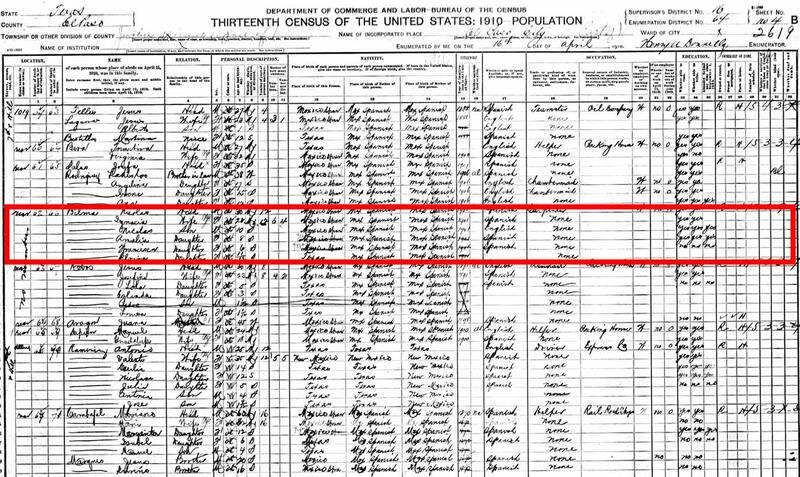 The census notes that the family moved to the United States in 1901, and that Nicolas was working as a carpenter. He does not appear in any El Paso city directory after 1910, but he is mentioned in an El Paso Morning Times newspaper article from February 1912 suggesting that the Vielmas likely moved to Clifton, Arizona between February 1912- June 1913 (per oral tradition, his youngest son Benjamin was born in June 1913 in Clifton). It is unclear how much longer Nicolas stayed with the family, but we are certain that at some point between 1913 (the year of the birth of his youngest child) and late 1916 he left and was never heard from again. According to oral tradition, his son Nicolas Jr. traveled from Clifton, Arizona to Los Angeles on several occaions during the late 1910s to attempt to find his father, but was unable to locate him. There are several time and pay roll records from January 1917 to December 1919 for Nicolas Vielma while he worked initially as a laborer and later in the engineering department of the northern division of the Pacific Electric Railway Company. He appears in the 1920 census in Arcadia City (Pasadena Township), California and is listed as aged 46 (consistent with an 1873 birth). The census notes he was still married, living alone as head of household in Arcadia City, and working as a laborer for the electric railroad. Elvira, born April 18, 1911 in El Paso, Texas, married Oscar Sessman. Nicolas is not listed in the 1930 census and is presumed to have died between 1920 and 1930, although to date no civil or church death record has been located. Ignacia died of heart disease on April 30, 1960 in Clifton and is buried at the Sacred Heart Cemetery. According to her baptismal record, Francisca was born in Ciudad Juarez, Chihuahua on August 28, 1904 (her civil birth record says September 10). Family oral tradition notes that Francisca was born in Juarez even though her family had lived for several years across the Rio Grande in El Paso, Texas. The story goes that her mother Ignacia had gone to Guadalupe to visit family and then had the baby while still in Mexico. 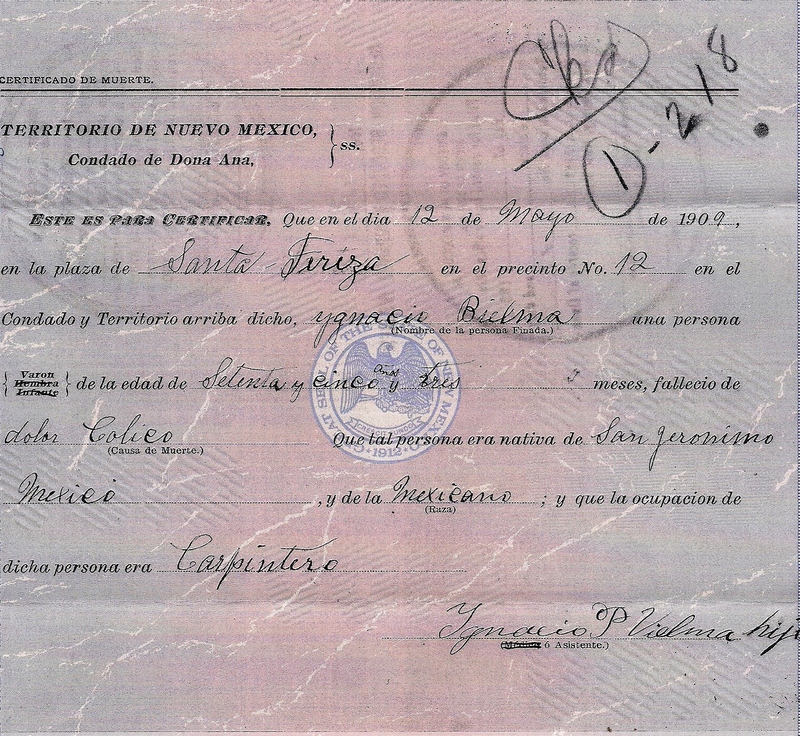 Francisca’s civil birth record does note that while both of her parents were originally from Guadalupe, they were residents of Ciudad Juarez at the time of her birth. What is certain is that she is the last Vielma of our line to be born in Mexico. She lived in El Paso, Texas until about the age of eight before her parents settled more permanently in Clifton, Arizona. 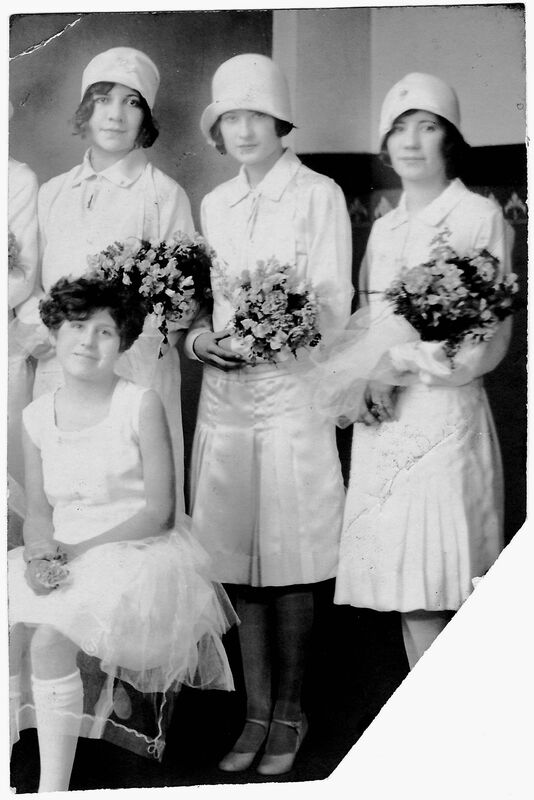 There is little information regarding Francisca’s early life, but as the middle of five siblings, she must have had difficulties standing out. And yet, we know that later in her teens and twenties, she did just that. Francisca made some incredible (particularly for the time) academic achievements. Firstly, she graduated from Clifton High School in the early 1920s, during an era when the majority of school-aged children in the United States (regardless of race of ethnicity) only completed an 8th grade education. 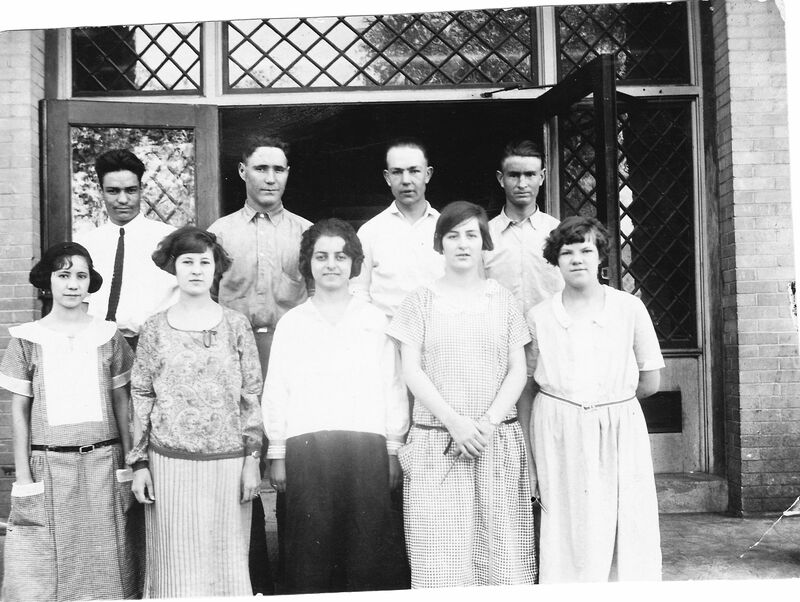 As the elementary schools in Clifton during the early 1900s were still segregated by race/ethnicity, the towns sole high school remained overwhelmingly white, making Francisca’s obtaining of a high school degree quite remarkable. Francisca is without question the first person in her family (Vielma or Escajeda) to attend college. Per oral tradition, her siblings all chipped in to cover tuition since Francisca had demonstrated such impressive scholastic achievement in high school. She likely enrolled in the Tempe State Teachers College (the forerunner of Arizona State University) around 1925. 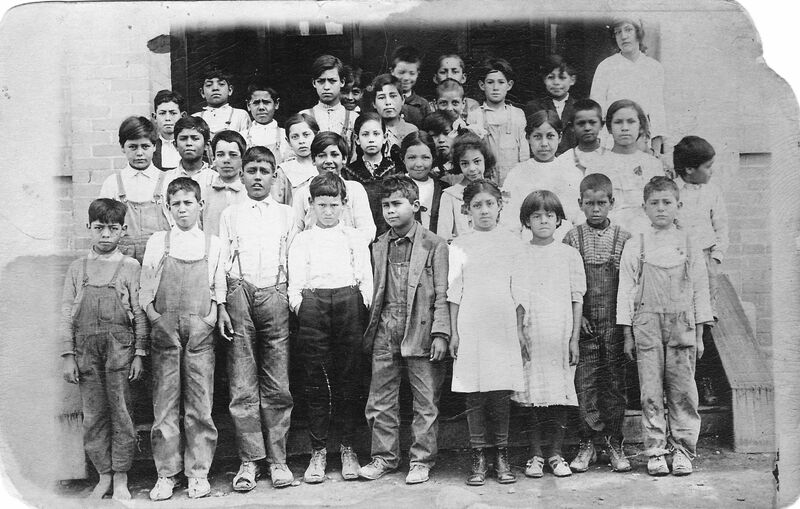 The college had been founded in 1885 by an act of the then-Territorial legislature and functioned for its first 50 years primarily to train teachers for work in Arizona’s public elementary and secondary schools. 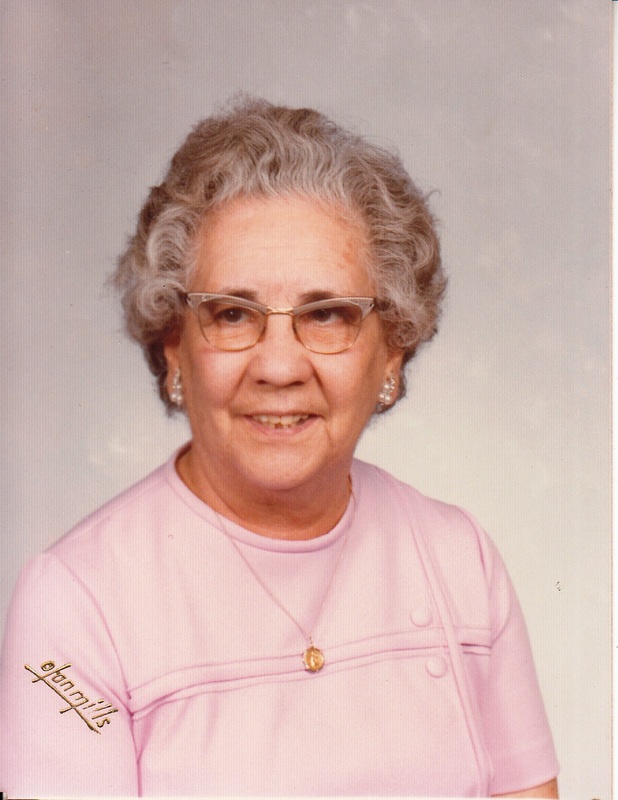 Francisca completed her studies in 1928 (the same year the school changed its name to Arizona State Teachers College) earning a teaching certificate. It is important to contextualize how significant Francisca’s achievement truly was. 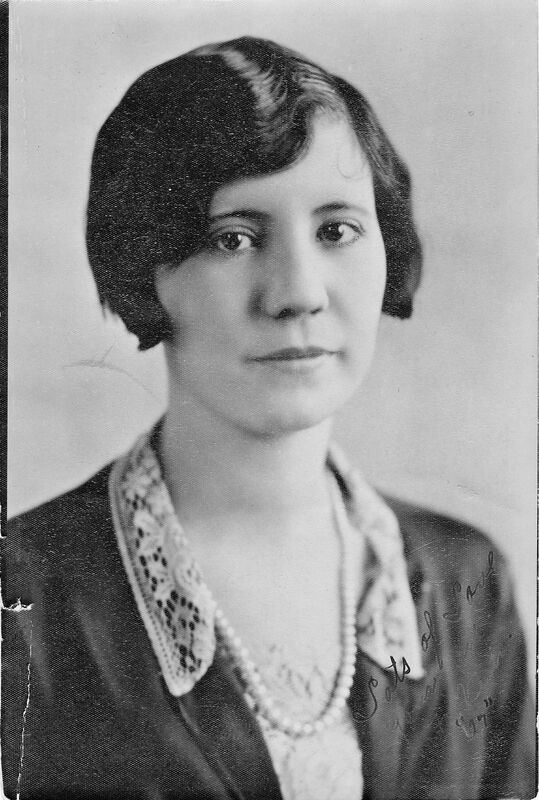 According to U.S. Department of Education statistics, in 1930 (two years after Francisca graduated) only seven percent of the U.S. population was attending college, and less than half of those attending were women. This means as a woman she was already in a tiny minority. Add to this the fact that Francisca was a Mexican woman from a very small and, at the time, largely segregated copper mining town and the magnitude of her accomplishment becomes even more apparent. Despite the incredible accomplishment of having a teaching degree from an accredited college, Francisca was not permitted to work in the public schools in Clifton – solely because of her ethnicity. For several years after finishing college through the early 1930s, Francisca lived with her sister Amalia in Belvedere, Los Angeles, California, where she spent some time employed as a salesperson in a department store. She later returned to Arizona around the early-mid 1930s, although we are unsure about the year. 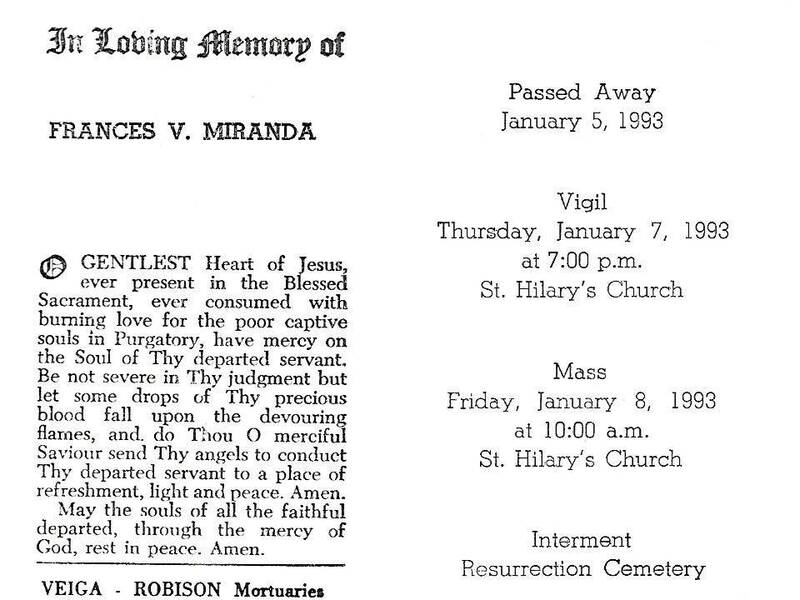 On November 4, 1937, she married Romulo Lucero Miranda at the Sacred Heart Catholic Church in Clifton. The ceremony was officiated by Father Joseph Mele. Ofelia Fernandez served as Francisca’s Maid of Honor. She gave birth to four children (three surviving to adulthood) and spent most of the 1940s and 1950s raising them. She also had some opportunities to apply her degree by helping those children in Clifton that had learning disabilities. According to her naturalization certificate, she became a U.S. citizen on May 10, 1943 at the Superior Court of Greenlee County in Clifton, Arizona. In 1951 she nearly died of complications giving birth to her fourth child, John, at only 23 weeks gestation. John was delivered on March 18 and lived for several hours. Francisca miraculously survived the delivery, despite the doctor’s warnings. Her husband, Romulo promised that if Francisca survived he would say a rosary every night until his death and make a pilgrimage to the Cathedral in Mexico City – promises he kept, and in the case of the rosary, until his passing. During the latter stages of life, doctors diagnosed Francisca with Alzheimer’s disease. The condition, coupled with Romulo’s deteriorating health, led them to move permanently from Clifton to Pico Rivera, California in the mid 1980s, where she lived until her passing. Francisca passed away on January 5, 1993 in West Covina, California and is buried at the Resurrection Cemetery in Los Angeles. My name is Antonio Robles.my grandma name is patrocinia vielma.she was born in elpaso,tx.in1901.are we family? Antonio, thanks for visiting! We could be related through Patrocinia’s husband, who I beleive was a Vielma although I would need his first name. Your grandmother was born Patrocinia Rivera – her father was Bernardo Rivera. Let me know if you find more information about Patrocinia’s husband. Hi; this is Maria Vielma i live in anahuac texas, i married Juan Guadalupe Vielma en Jimenez Coah. Mexico hi is a son of Antonio Vielma Ramirez hi was a son of Esteban Vielma and Maria Ana Ramirez and i know that hi was a grandson of Perfecto Vielma from Parras de la Fuente Coahuila are we the same Vielmas . Hi Maria, sorry for the delayed reply. None of those names appear in my list of Vielmas, but as the name is not so common, we must have a connection somewhere. 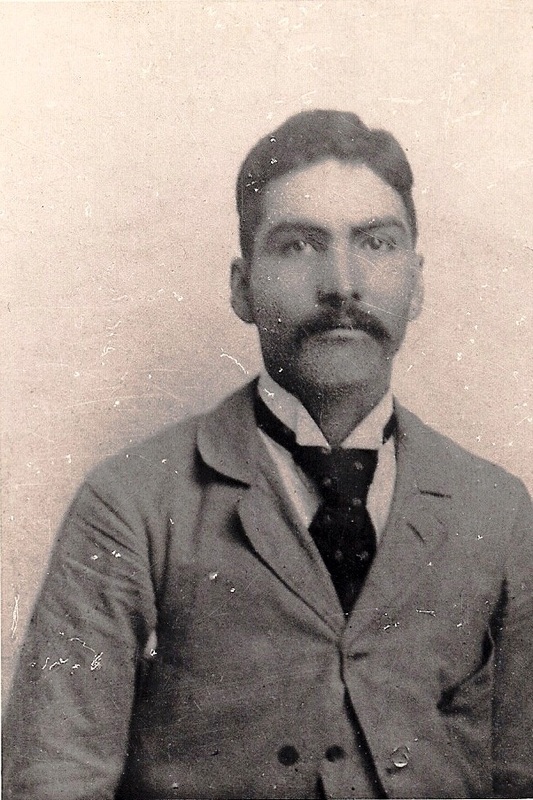 I believe my branch of Vielmas was from Viesca – my GGGG grandfather Antonio Vielma was a soldier from the famed Segunda Compania Volante de San Carlos del Alamo, which had its roots in Viesca. Parras is not that far from Viesca, so it is possible we are related a bit further down the road. I’ll let you know if I come across these names in my future research. Hello Maria, My father is Apolonio Vielma. We live in Waco, TX. He would get mail with the Vielma -Ramirez last name on it all the time. They were from Piedras Negras Mexico but I believe my father was born in Jimenez. He would also talk about Musquiz. He mentioned a perfecto Vielma. And my fathers dad (my grandfather) was Solomon Vielma. My fathers siblings are Casimira, Dominga, “Tacho”, Rosalio. Are we the same Vielmas or does anything above sound familiar? Looking good primo. Keep up the good work. Very well written if I do say so myself! Greetings, my name is Luis Silva. I am looking for information about a soldier in the same company, his name was Francisco Arellano. I have located a census with his name on it, but not as detailed as the one pictured on this page. Where did I you find the census and/or do you have the entire census? Thank you, in advance, for the help. Hi Luis, I received the census years ago from a cousin but i’m not sure where or from whom he received the list. I do have the whole list and found a Francisco Arellanos. He is listed as 20 years old and married to Antonia Carmona, 20 years. Hope that is helpful! Yes, thank you. Would it be possible to get an image of the census via emal? My email is luisrsilva@ymail.com. An additional question, is Pedro Arellano(s) listed also? Don’t know if my first reply posted. Thank you, the information is helpful. Would it be possible to get an immage of the census via email? Hi Luis, I didn’t see anything for a Pedro Arellano, but just sent the census to your email. Hope that helps! Hi, my grandfa was Alejandro Vielma Garza, son of Francisco Vielma Vidaurri and Leonor Garza, are this names appear in your list? Hi Mayra, thanks for visiting! Unfortunately I don’t have those names in my Vielma files. Do you know where they were from? Hi Mayra, sorry for the very delayed response. I have not found the two names you listed in my list of Vielmas unfortunately. I would definitely be interested to know where they were from as it appears to be such a rare last name! My father is Francisco “Chito” Vielma, my grandfather is Francisco “Panchito” Vielma who is also the son of Francisco “Pancho” Vielma & Leonor Garza! I’m almost positive that your grandpa is my great uncle! Thanks Rose Marie. The names, dates, and locations are so close it’s hard to believe your Nicholas is not the same as the one in my tree. I’ll take a look and see if I have him in my folders somewhere and hopefully another visitor to the site can add to the discussion. Thanks for visiting! Hello Miranda. This is very interesting information. I have wondered about my Vielma Last name and this kind of shed some light. Although I wonder if we are related some how. Both my parents were from Piedras Negras Coahuila. My fathers name was Apolonio Vielma. He had brothers and sisters. Some of their names are “Tacho, Casimira, Minga, He had a brother named Rosalio that ran away from home when they were very young and he never saw him again. His mother died while he was very young so he doesn’t remember much about her. His Dads name (my grandfather) was Salomon. Salomon died while my father was already married here in the states. Apparently, Salomon had gone out for a walk and they found him in a field dead. My father told us that they found his father with his jacket under his head as if using it as a pillow to lay down and rest. I only mention the above hoping that other “Vielmas” might read this and maybe they heard a similar story about their family member, therefore connecting our family line somehow. Other connections that I remember my father talking about a lot was a town called Mosquis in Mexico. Also, my father would get mail with the last name Vielma-Ramirez. So we might have some connection with Ramirez as well. I do remember my father talking about a Perfecto Vielma, which I read on this blog that someone else mentioned a Perfecto Vielma. If you have a record with a Salomon Vielma I would really be interested in seeing it. Very informative , Jose Ascension Juan Nepomuceno, born May 15, 1833 in Aldama, married Maria Victoriana Hernandez we’re my great great grandparents do you have any information on Rafael vielma son of Jose ascencion vielma and victoriana Hernandez , I believe he married Francisca fuentes daughter of Dolores fuentes and Maria Solis . Please let me know if you have any information on them . Thank you ! My name is Alison Vielma. I’m currently living in Monterrey, Mexico. I have always been curious about my last name. The only thing I know about, is that part of my family from my dad’s side, comes from Parras, Coahuila. Beside that, he mentioned that indeed the last name has German roots and he even mentioned some Finnish ones. Thanks for the information, if by any chance you know more about it, let me know. My theory is that a German man and Italian woman found their way in Mexico when France was ruling and broke away from the french and sided with Mexico, only then to side with America. We have a history of being carpenters, I’m one also, and we all are more white then brown. This explains the German/Italian connection and I might add we really are a good looking family lol, also explains the Italian side of things. Interesting theory Christian. A Vielma in our family did a DNA test and there was some Italian markers that nobody could explain. The Hapsburg Empire stretched to Spain and Italy in the 1700s and there was a lot of movement of people between territories of the empire at that time – could help explain that! I’ve also seen theories that Vielma could be German. The Vielmas in my line started as soldiers but still cannot get that line back to Europe.